the nytpicker: NYT's Culture Editor Sam Sifton Explains: "Stars" Good, "Golden Spatulas" Bad. 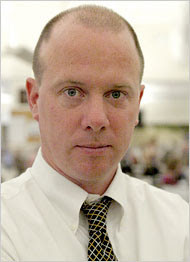 NYT's Culture Editor Sam Sifton Explains: "Stars" Good, "Golden Spatulas" Bad. In a WSJ piece yesterday on newspapers' use of the "star system" to rate movies and restaurants, NYT culture editor Sam Sifton self-righteously declared the paper different from newspapers that assign stars to reviews. "We don't seek to reduce our arguments about a particular piece of art to a number, or letter grade, or golden spatulas, or whatever," Sifton told the WSJ. "These are numbers that aren't based on any rational or countable thing." When asked by the WSJ about the fact that the NYT has long had a star ranking system to review restaurants, Sifton described that as "the exception that proves the rule here." So let's see if we have this straight. According to Sifton, the NYT won't "reduce" its arguments on movies to a star system. It also won't use "golden spatulas" to rank restaurants. It will, however, continue to use stars in its restaurant reviews. NYT editors usually have coherent, well-considered arguments to explain the paper's policies. Sifton appears to be the exception that proves the rule.